David Fincher’s Fight Club has a plot like nothing you’ve ever seen – it challenges your expectations, makes you think real hard and leaves you laughing out loud. In my eyes, it is the ultimate cult classic. It follows the unnamed Narrator (Edward Norton), an insomniac who leads a directionless life. He visits support groups for men with testicular cancer, attempting to cure his insomnia by nurturing and sympathising with the other cancer sufferers. His dull and stagnant life is turned on its head when he meets the mysterious soap salesman, Tyler Durden (Brad Pitt). In a bid to escape their mundane lives and better yet, oppose and challenge their consumerist society, the two men form an underground fight club. It expands into something much bigger and the Narrator soon finds his life spiralling out of control. As one of my all-time favourite films, there are so many ways Fight Club can be interpreted, which makes it such a fantastic watch. One thing is for sure though; this film is not just simply about a couple of guys who start up their own fight club for the sake of it. The film is much deeper and innovative than your instincts may tell you. With the use of symbolism and black humour, it voices the dark fantasies, anxieties and desires of the pre-millennium working man. The Narrator finds himself drawn into a violent and chaotic world, alongside the confident and charming, Tyler. Also involved in their escapades is Marla Singer (Helena Bonham Carter), a classic femme fatale, and she finds herself stuck in the middle of the men’s lives. Fight Club is pretty faithful to the original novel. Tonally, both the novel and the film are very similar as well. Whilst they’re equally as dark, I believe the film is actually superior to the book, which is quite a rare occurrence for adaptations. Unlike most films that were originally a book, Fight Club actually explores the characters and their relationships with each other in even more depth. The film is an improvement on an already great novel. 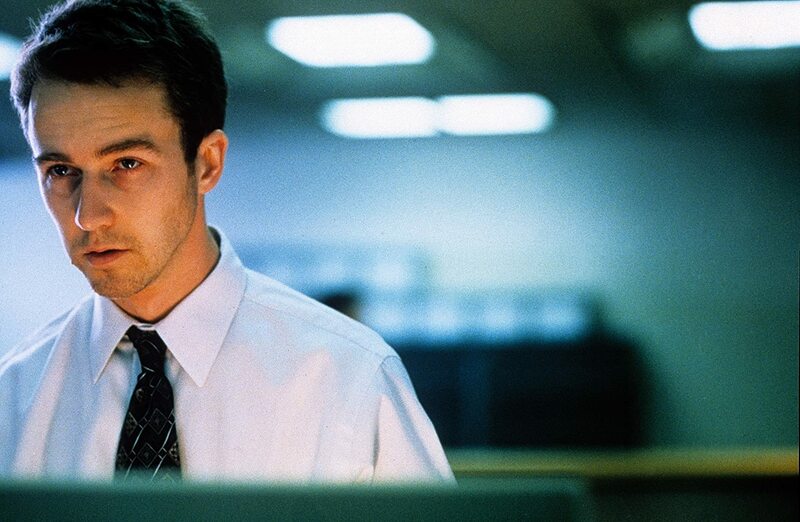 The performances of Edward Norton and Brad Pitt is one of the main reasons the film is so engaging. They play their characters brilliantly, especially Norton whose character we are made to identify with. As more and more fight clubs start appearing all over the country, with Tyler Durden leading the movement, the viewer is plunged into the crazy journey. Norton’s character is pitted against much more physically dominant men in the fight club, but otherwise, they are ordinary guys just like himself. The fights are unflinching and bloody. As some may argue against, the film does not glamorise violence. It is a highly satirised commentary on isolated young men, who feel they have no place in society. The fight club provides a platform where they can reassert their identity and “hypermasculinity”. Despite the film’s slow start, it is joyously entertaining with top class comedy and still manages to be thought-provoking. How fight club transforms into a larger anti-capitalist movement is a chain of events I won’t spoil here. The film really plays with your expectations, defying genre conventions in the process. As a psychological, action-packed, black comedy satire, it doesn’t quite fit into any particular genre. Crucially though, Fight Club contains everything which is needed for a really enjoyable film. Fight Club is definitely one of the greatest films of all time. I have watched it multiple times now and it never ceases to entertain and amuse. It has terrific performances, it’s visually compelling and has a narrative that pulls you of your comfort zone. Even to this day, it’s still frequently watched, loved and appreciated, having established a large cult following. There is no doubt that Fight Club is a timeless film. Let me know what you thought of the film in the comment section! Thanks. Same here, really didn’t see it coming when I first watched it. I can’t imagine watching it not ‘knowing’ ! Great review. For one reason or another I’ve never been able to connect with the Fight Club enthusiasm. I certainly appreciate some of the things it’s going for, but overall I just couldn’t get into it. Thanks and that’s fair enough. Fight Club usable gets mixed responses from people anyway. What about the film couldn’t you get into? Good review. Such a great movie….a true classic. Yes! 1. Love your review 2. Love the movie. 3. I’m only friends with people who also loved the movie. Cheers! !